The scene of the crime: Birmingham's Chamberlain Square. Image: Wikimedia Commons. In terms of form the Central Library is hard, blocky and exquisitely realised. The squat, inverted ziggurat set amidst Blade Runner-esque towers and gantries are reminiscent of nothing less than a space station – as if a slightly retro civilisation of space travellers decided to set up camp in the centre of Britain’s second city. There are few easy earthly architectural comparisons, beyond the ancient ruined cities of South America, Cambodia and central Iraq. The overall effect is one of sublimity rather than beauty, of brutalism at its brutist, of brutalism at its best. Yet, within weeks it will be no more. Birmingham City Council has been seeking to demolish the place for years. Now, a gathering speculative property boom in Birmingham, engendered by the promise of HS2 (and the fact that even London can’t absorb all the capital pouring into the UK’s property market) is providing the incentive for developers to do something about it. 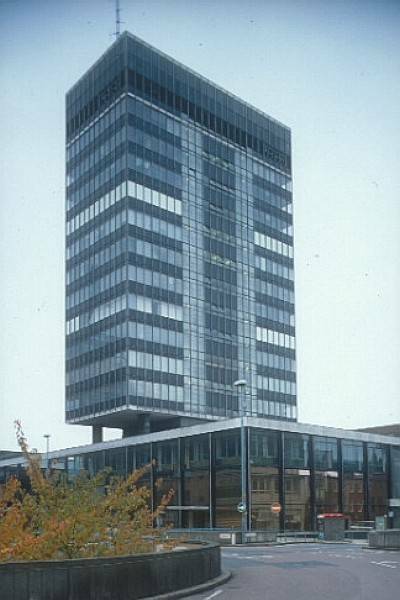 Officially, in the 40 years since its opening the Central Library has become symbolic of a grey, concreted vision of Birmingham that the city council is keen to shed. Unofficially, with the Council’s budget position amongst the worst in the country, a situation graphically illustrated by the eye watering cuts proposed at the Central Library’s successor only 18 months after it opened, the money gained by selling the building’s prime city centre site is much needed. It’ll be history that judges whether the Council has made the right call. Public opinion regarding mid-20th century architecture has undergone a sea change since the 1980s, when Prince Charles issued his glib pronouncements about modern architecture. This shift in attitudes is bound up with an undoubtedly rose-tinted view of the post-war era as a time of optimism, of social openness and progress. All the same, it’s clear that the taste for post-war architecture now extends far beyond the architectural profession. Witness English Heritage’s decision last month to extend listed status to 14 standout examples of post-war office design. In Birmingham, meanwhile, the Bond villain-or at least Austin Powers-worthy houses designed by John Madin, the father of the Central Library, sell for up to £1.8m and rarely for much less than £500,000. Sadly, the dwindling might of press led years ago to the replacement of his Post & Mail Building – the West Midland’s greatest contribution to the international style – with an underground car park. 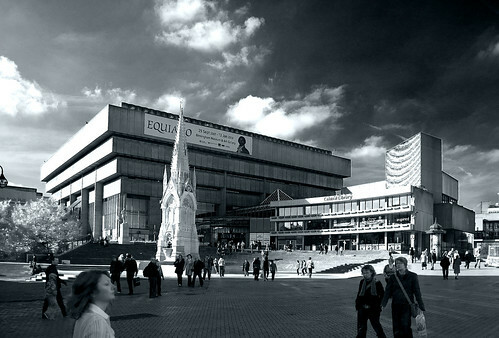 Could Birmingham Central Library be a “Euston Arch” moment for modernists? Undoubtedly so. The claims of “social cleansing” that surround the redevelopment of other brutalist masterpieces like the Park Hill Estate are well founded. But Urban Splash’s work in Sheffield showcases how a modern building can be wonderfully rehabilitated, given some care. Conservation needn’t be preservation in aspic. Given Birmingham’s recent economic uptick and the public’s growing fondness for modernism, it’s easy to imagine the Central Library becoming a popular social or cultural centre. Perhaps garishly painted, swathed in street art or at least cleaned, it could have become a symbol of Birmingham’s post-war prosperity, as it blends into another brighter period. Perhaps that’s the problem? Birmingham’s brutalism, what remains of it at least, is a reminder of a time when Birmingham’s economy was roaring, when a society of equality and plenty seemed within grasp. At a time when libraries across the city are closing rather than opening such optimism seems a nostalgia trip.